At its core, Legends (that’s how the cool kids refer to it) is about creating your personal story in the Wild West before — presumably — dying of dysentery, typhoid, diphtheria, or at the hands of a dentist or doctor administering drugs laced with alcohol or opium. Let’s make America great again, shall we? 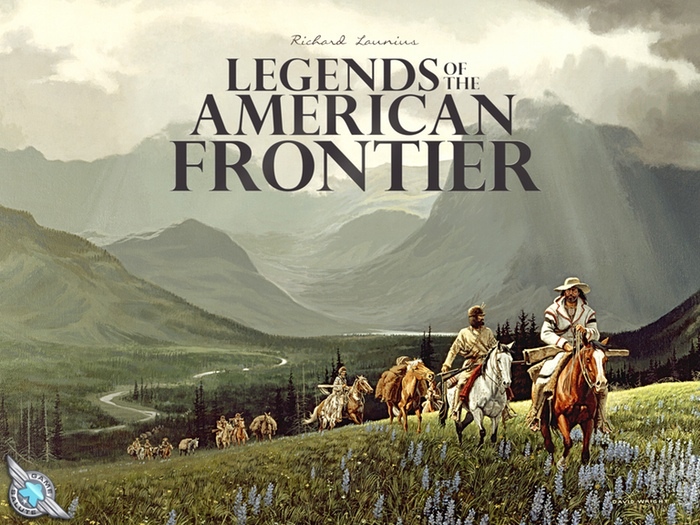 In Legends of the American Frontier you’re not just creating any old story, you’re trying to build the best, most interesting history you can muster, rife with adventure, violence, survival, business, revenge, politics, and perhaps a smattering of infamy. In fact, it’s not uncommon to find yourself dabbling in all of these disparate permutations of the human condition by the end of the game. You don’t just create your future history, however. Your backstory also plays a part in the legend about to unfold. A really fun card-drafting mini game takes care of that (the Upbringing Phase) and establishes your character’s early years, which informs his or her skills. In essence, you are “rolling up” your character. If you draft the “Promised Ma to abide by the Good Book” card, you dial up two points of Providence on your character card. “Born into a wealthy shipping family from Boston” gives you four points of Capitalism. 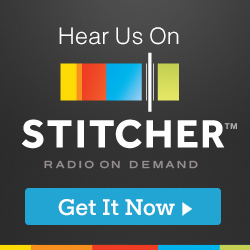 “Served as a courier for the Continental Army” gives you points in Personality and Fight. Skills in Knowledge, Luck and Frontier round out the other ones. There are a ton of upbringing cards, and you get to select four of them during the draft. With your personality set, you spend most of the game deciding where to have your next adventure and ultimately attempting each one solo or in groups. Whatever the case, you’re always trying to “win” the adventure away from your opponents to receive the spoils. 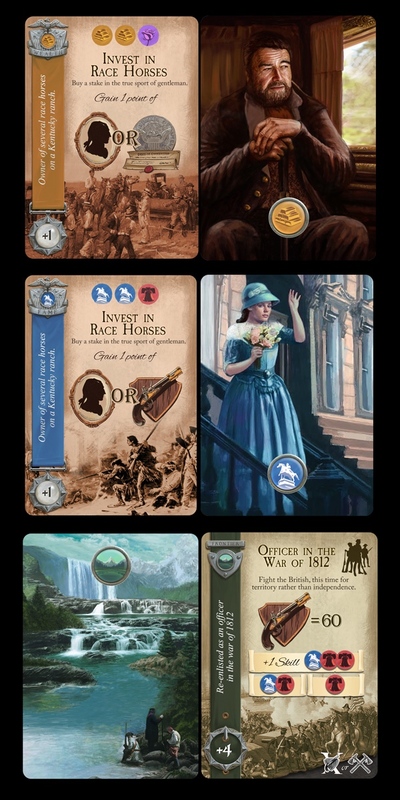 Adventure locales are appropriately themed and situated Back East, in the Frontier and out in the Far West, all of which are populated by different adventure cards. Of course, it’s not just you against the world. This is by no means a solitaire game played with friends. 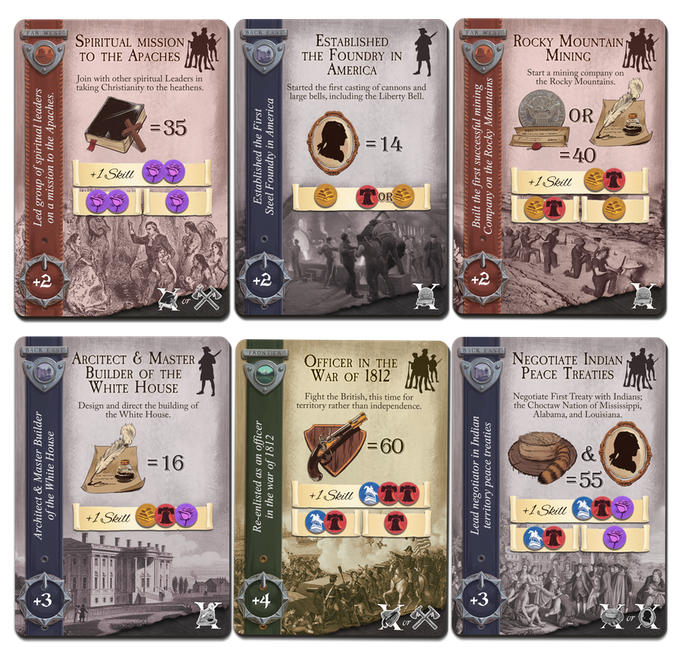 You may not be the only player wanting to “Command Troops in the Whiskey Rebellion” back East. And the adventure that’s asking you to “Join the Texas Rangers to Bring Bandits to Justice” isn’t going to succeed with a single cowpoke. This sometimes makes Legends of the American Frontier more of a social game while you hash out who’s courageous enough to join you on a “Spiritual Mission to the Plains Indians.” All adventures may or may not end well. When they don’t, you’ll be forced to draw a penalty card that adds even more “story” to your life, such as a card declaring that you’ve been in the wilderness so long that you’re thought by all to be dead. Or you may find out that your livery business has failed and has burned to the ground. On the other hand, when all is well and you’re succeeding at what you set out to do, you’ll start racking up reward tokens and adventure cards. The rewards in Legends are your currency, and you’ll use them to buy reward cards that have victory points on them. Collect lots of wealth and status rewards, and you may be buying stuff like “Devoted to Building a Large Shipping Company” and “Hiring a Personal Butler.” The stuff of legend. There are also fame and happiness awards. All of these adventure cards and awards add up to something in the end, and the winner is the person with the most victory points, and hence, the best legend. The resolving adventures part of Legend is truly a lot of fun. 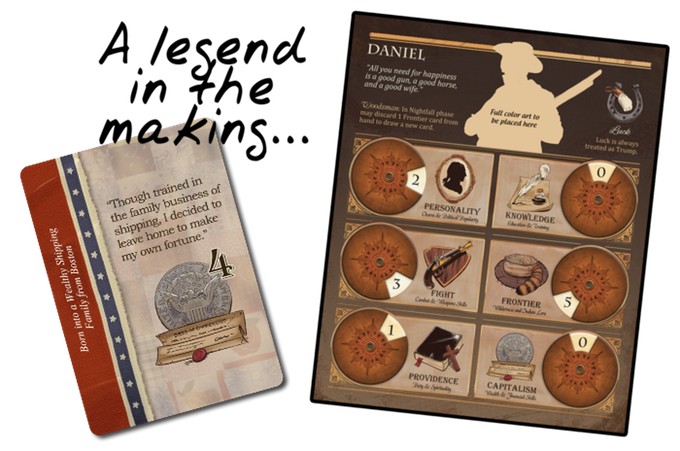 Everyone has a hand of skill cards and you play these cards to add points toward a target number on the adventure card itself, also adding in your pertinent character skill points. What’s particularly neat about this is you get to play one or more cards (if you are using “American Ingenuity” — that is lower-valued cards that match trump), and then you draw random card(s) — the Destiny Deal — to add to the total off the top of the deck, only stopping when you hit a non-Wild, -Trump or -Luck card. Yes, that mechanic certainly has “luck” written all over it, and some gamers cringe at the thought, but an element of luck in a western-themed game is surely a clean fit and hearkens back to games of chance that were widespread at the time. 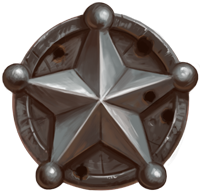 There are also the nifty True Grit tokens (heavy metal stars in the Kickstarter edition) that you can use to discard a Destiny Deal and draw a new card in its place, or you can turn one in to avoid drawing a penalty or hardship card. One friend said the True Grit tokens themselves may be the coolest game piece he has ever seen in a game! They have some serious heft! And I’ve already mentioned the oddly satisfying Upbringing Phase to create your backstory. I’m always a bit sad when this early phase is over, almost wishing Legends was a full-fledged card drafting extravaganza, but that’s downright personal bias speaking right there. For a game that’s all about creating your personal legend, I found that I wasn’t much drawn into my story beyond the Upbringing Phase (early card drafting portion) of the game. Yes, you will find flavor text on the cards, but I found myself looking more (or exclusively) at the potential gains, the target number and symbols needed to win each adventure. History be damned! I would add that Legends designer Richard Launius (also a legend) is the genius behind Arkham Horror, so it’s not entirely unreasonable to expect a little more immersion or story in this game. Of course you could (and probably should) argue it’s a different game entirely, so why look for the same? Okay, good point. Shut up. What I’m saying is the structure of the game works well mechanically, but I don’t believe it yields the immersive character building experience I was expecting. The end game encourages a re-telling of each player’s legend, using the thematic synopsis printed on the edge of each card. This “Legend Stage” is really just fluff and has no bearing on the outcome, unless you award points for the “Best Tale” per the optional rule. My group — usually all about squeezing as much theme and story out of a game as we can — didn’t really have the motivation at game’s end to partake in the prescribed storytelling exercise. Doing so just didn’t seem to fit the game we had just played, and this final phase felt manufactured in order to make the game seem more story-driven and thematic. We were satisfied to just add up our points and move on to something new. 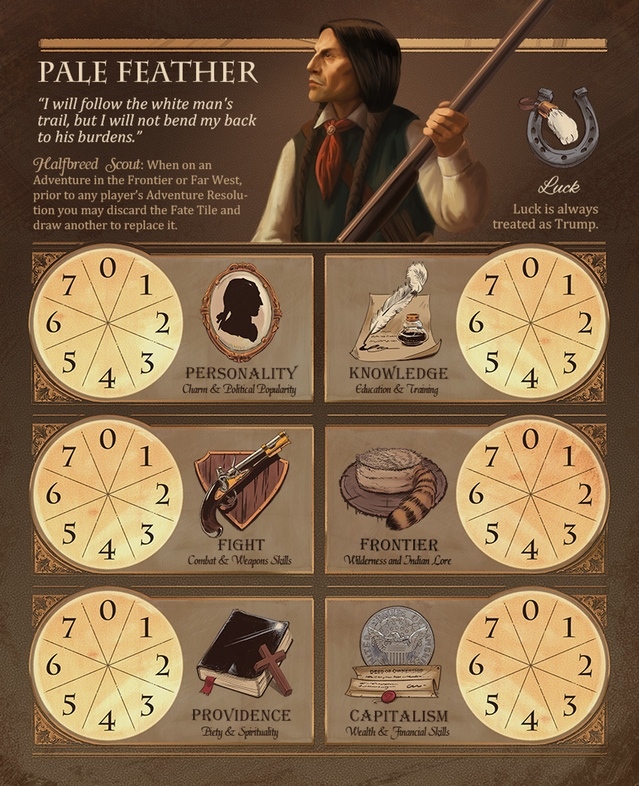 Legends of the American Frontier is an enjoyable game, but it’s important to not get your hopes up and expect an immersive, thematic trip into the life of a pioneer in the colonial days of America. In that respect it is a minor disappointment. All the trappings of adventure are here (flavor text, cool characters, stunning artwork), but I found the game play itself to be more mechanical in nature, and regrettably the theme winds up lost somewhere on the frontier.